Just after noon and we were the second customers, a nice pub and we were tempted to stay for a second one but decided against it because of the annoying advertisements on a commercial radio station that was being played. Mid evening visit. More solace here after the noisy Malling Jug. Good chat with a couple of fellows who had seen me in said Jug earlier. The Bull seems like the most traditional pub in West Malling and a good range of local beers to boot. Eight ales on but can't remember them all! Mid-afternoon visit. Fairly busy with drinkers. 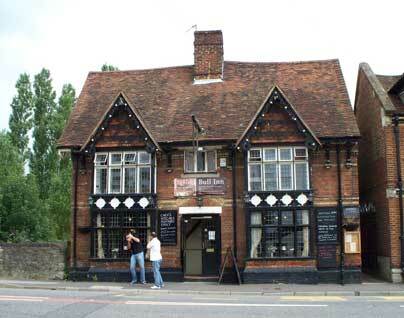 The pub is found in West Malling, Kent, ME19 6QH. Central bar serves smaller room with dartboard and main bar. Very attractive bar with lots of wood, wooden beams and hops hung from the ceiling. Rear patio for good weather and gazebo for smokers. Lots of stripped brickwork. 8 handpumps on bar. Prints of old West Malling / Kent on walls. Perhaps the least spoilt of West Malling's pubs. We have visited this pub 62 times, seen 128 different beers and tried 96 of them.